Megaventory Blog - Online Inventory Management Software, Order fulfillment and Control System: An exciting new partnership! We are proud to announce our partnership with Deutsche Telekom subsidiary, COSMOTE, the largest telecoms provider in Southeastern Europe. Another development which has been in the works for quite some time now and can finally be announced is the brand new deal we have struck with COSMOTE, the largest telecommunication provider in Southeast Europe! Megaventory is one of the very few early solutions to be included in the newly launched B2B cloud marketplace of COSMOTE (a Deutsche Telekom subsidiary). As a result COSMOTE business customers will now be able to subscribe to the Megaventory service directly from the COSMOTE Business Marketplace Megaventory page which is specifically designed for this purpose. Subscriber companies will receive a single monthly bill including their Megaventory subscription cost along with their other telco services. 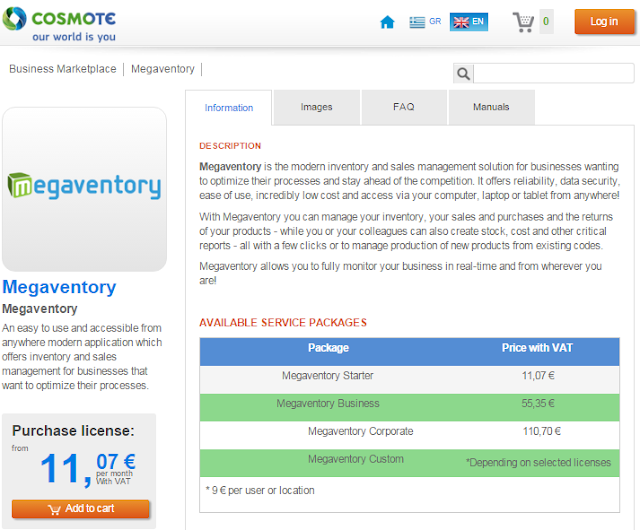 The Megaventory pricing remains essentially the same regardless if an account is purchased via megaventory.com or the COSMOTE marketplace. At the same time, a COSMOTE business will also enjoy the added value and support provided by this huge player in the market and its other important partnerships and deals. This is definitely one of Megaventory’s most important partnerships yet and an exciting opportunity as it opens up a large market of hundreds of thousands of small and medium businesses in the broader SE region. What’s more, we’re proud to associate the Megaventory brand with that of COSMOTE – a move which is likely to lead the way for more such high-caliber deals. The Megaventory – COSMOTE partnership is meant to be the first of more to follow in the European and global market within 2016 and a stepping stone for other significant marketplaces currently in the process of expansion (such as that of Deutsche Telekom, the parent company of COSMOTE and also the company behind T-Mobile, EtiSalat and du in the EMEA region, etc). Excited as we are about this announcement the development effort in Megaventory is picking up speed and we will soon be announcing even more exciting features and integrations. Stay tuned!